Charles Ross is a large versatile English apple. It can be eaten fresh, and has a sweet Cox-style flavour. It is also a good baking apple, and useful for apple tarts because slices keep their shape when cooked. Charles Ross is a mid-season variety, and also keeps fairly well, although the flavour fades in storage. The large apples are very attractive, and look great in a fruit bowl - indeed this is one of the prettiest Cox-style apples. Please fill in the details below and we will let you know when Charles Ross apple trees are back in stock. A classic English dual-purpose apple, and a good alternative to Charles Ross. Charles Ross is in flowering group 3. Charles Ross is self-sterile and needs to be pollinated by another tree of a different variety nearby. Since it flowers in the middle of the blossom season it can be pollinated by most other apple trees. Charles Ross is an excellent garden apple variety. It is easy to grow and has some natural disease resistance. This is also a good variety if you have chalky soil, as it is more tolerant of alkaline conditions than most apple trees. Charles Ross was raised by Mr Charles Ross, who worked at Welford Park Gardens near Newbury, Berkshire, UK in the 1890s. 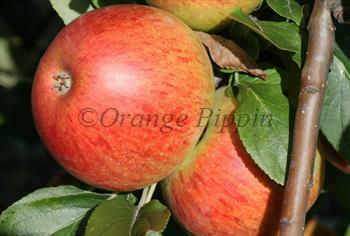 It is a cross between Cox's Orange Pippin and Peasgood Nonsuch.